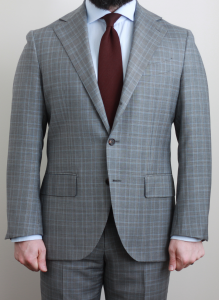 In my post reviewing Spier & Mackay’s off the rack suits, I wanted to review their suits because those were some of my initial purchases. Now, on theme with the blog’s title, I’ll be covering what happened after the suit: Spier & Mackay sport coats. I highlighted a lot of fit issues that I have with their suits in my review post, and if you read my #menswear post, fit is the latest hill I’ve climbed, so perhaps the suit review was written with a more critical eye. For whatever reason, their sport coats seem to fit me better. I believe I have sloping shoulders, and a slight dropped right shoulder, yet the sport coats don’t seem to have the divots at the sleeve head. 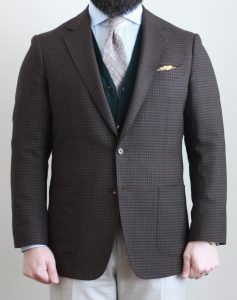 Many of the latest sport coats have minimal shoulder padding – or even no canvas whatsoever, yet I don’t seem to have the same issues as I did with suits. Like their suits, they offer two styles of sport coats, and I’ll do my best to break them down. Spier & Mackay have also increased the number of offerings almost every season, sourcing more textured and upscale fabrics from the likes of E. Thomas, Abraham Moon & Sons, Angelico, and Zignone. The standard 2 button is the same cut as the suit jacket, but replaces the flap pockets with patch. Basic, neat and classic. A sport coat in this cut will always be relevant. 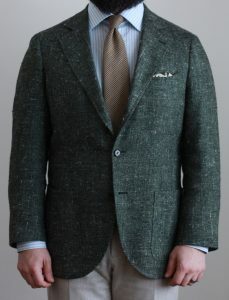 The first few sport coats were mostly to patterned worsted fabrics and occasional wool/linen and wool/cashmere blends. I have a few of these in my closet and happily wear them, but Spier & Mackay has another cut that I’ll be selecting for my future purchases. There are a number of differences vs the standard cut: the quarters are more open, though not quite to the extent of the Neapolitan, the shape and roll of the lapels occurs a little higher above the middle button, and to my eye the gorge is a slightly bigger, more open shape. I really quite enjoy the way these jackets wear. Soft and supple feeling that is more like layering a sweater than wearing a sport coat. Fabric selection this fall/winter has been key – this slubby, delightful fabric is a wool, silk, cashmere blend from E. Thomas that was offered in the green pictured, plus navy, burgundy and grey. I almost bought the burgundy, but ended up sticking with the green as it was a little more subdued in person. To me, this Neapolitan cut is evolving into maybe the perfect sport coat style. The overall silhouette and especially the shape of the lapels and quarters has a ton of character, and broadens the applicability on the casual-formal spectrum. Some of this feeling might be contextual to the fabrics I own in this cut – the beautiful fawn Donegal tweed pictured here, and the earthy gun check tweed – both from Abraham Moon & Sons. These tweed jackets look equally at home with a tie and trousers or with an OCBD and denim. As mentioned elsewhere, I’m looking forward to seeing the revisions the v3 brings (slightly higher armholes). Spier & Mackay made some tweaks to this cut that really improved the fit for me. There seems to be better front/back balance than the v1, and a bit more room in the chest and across the shoulders. A tug down on the lapels is still required to seat it better on my shoulders. Doing this ensures that the darts in front drape perpendicular to the floor. My most recent purchases are jackets in 42R in slim fit – they are approximately 1/2″ narrower in the body. However, with this one I was advised to size up from slim to contemporary due to the fabric weight. On my other tweed jacket, I went a whole size up in a 44R contemporary. Spier & Mackay have done well with fabric selections but there shouldn’t be that much disparity in sizes. Size is part of fit, and fit should be consistent. This sport coat is soft. Really soft. I don’t just mean the fabric. The complete lack of canvas and structure means it wears like a sweater. It does take a little getting used to – for instance, I seem have side-to-side balance issues where I need to straighten out the jacket sometimes. The shoulder seems to fit quite well, with no divots. The sleeves feel wider, which may help the shoulder situation (I haven’t measured to confirm). Classically cut, this is your standard sport coat – medium width lapels, patch pockets, inoffensive shape. This sport coat model fits me pretty well, though the example I used seems tight through the shoulders (the result of layering a cardigan). I do appreciate the fit across the back, shoulders and chest as it really wears better than the Neapolitan models. No need to tug the lapels on these beauties! 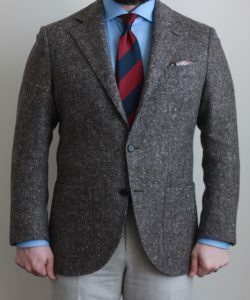 No surprise, but I’m very happy with my Spier & Mackay sport coats. I’ve had no major quality issues with any of the dozen that hang in my closet. I would highly recommend Spier & Mackay for anything from the basics to the more advanced pieces. Personally, I’m looking forward to seeing what Spring/Summer 2018 brings!